Flashback Friday is something we post every other week to recount the many amazing trips and hikes Veronica and I went on before we started this website. We have lots of photos and lots of memories, so we figured we might as well write about them. In 2012, Veronica and I, along with our good friend Chris Gove and his daughter Gianna, were on a trip down I-84 in Oregon to go to the U.S. Track and Field Olympic Trials in Eugene. 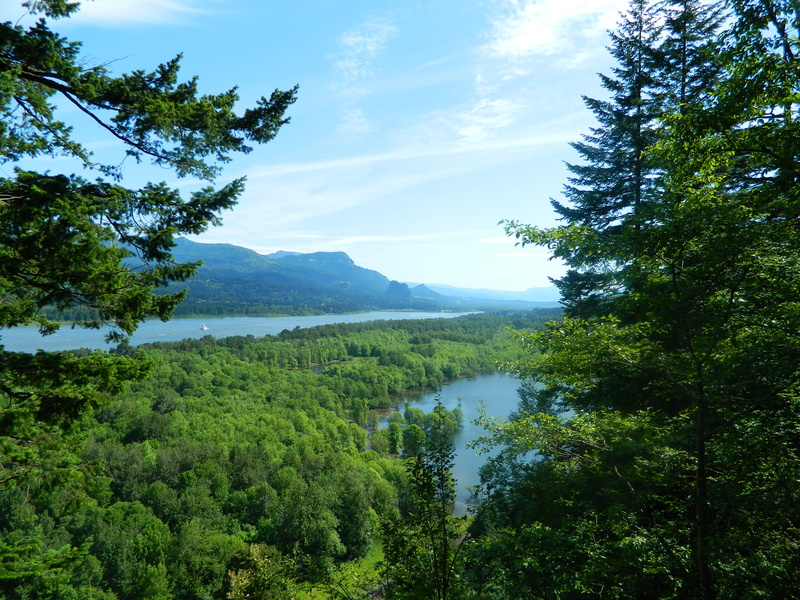 On the way, Veronica and I wanted to do a hike because the Columbia River Gorge is so amazing. The crew in the best photo spot possible. This is one of my most treasured photos and hangs on our wall at home to this day. Such a unique place to visit. So, after some Googling we found Ponytail Falls (which is called upper Horsetail Falls on some signs in the area), which suffice to say is amazing. Horsetail Falls is off of Exit 35 on I-84 on the Old Columbia River Highway, and has a nice large parking lot (though no bathrooms). This is the area where most tourists will take their photos and then keep driving, and that is OK because the falls in this area are stunning. But if you are willing to put in a little sweat effort, Ponytail Falls are even better. Horsetail Falls is right on the Old Columbia River Highway, which runs parallel to Interstate 84 in Oregon. We climbed the switchbacks that immediately greet you and they about destroyed us. You are going from river level to the top of a major bluff in about a half mile – our friends from Texas soon lagged behind, but that’s OK, there are very few hills in Texas. Eventually we reached the top of the bluff and were rewarded with stunning views of the Gorge. Our Texas friends were laboring up the switchbacks. It wasn’t very warm at the start of this day, and we did about 400-feet elevation gain in a little under a mile to kick the hike off. They didn’t seem enthused at this point. The view from the top of the bluff on the way to Ponytail Falls. You can see Beacon Rock on the Washington side of the Columbia River in the distance. There are plenty of warnings and signs in this area about people who have died by falling off the bluff edge here, so keep your children close. As you continue up this trail you will hear Ponytail Falls before you see it. Eventually you turn a corner and there it is – it’s not the biggest waterfall we’ve seen, but it is certainly the only one that allows you to walk behind it. Feels like you are on a tropical island! Yet, there you are, in north-central Oregon, enjoying a rare sight. We grabbed lots of photos, enjoyed the mist, and kept onward. We ran into a few other nice creeks along the way, and another waterfall, but none that compared to Ponytail Falls. Ponytail Falls with the hiking trail behind it. Really beautiful and peaceful scenery, as few tourists bother to put in the effort to climb the bluff to see this area. The hike down was just as steep as the hike up, but our entire party enjoyed going downhill much more. Photo of our hiking group, (from upper left going clockwise): Craig, Chris Gove, Gianna Elston-Gove and Veronica. 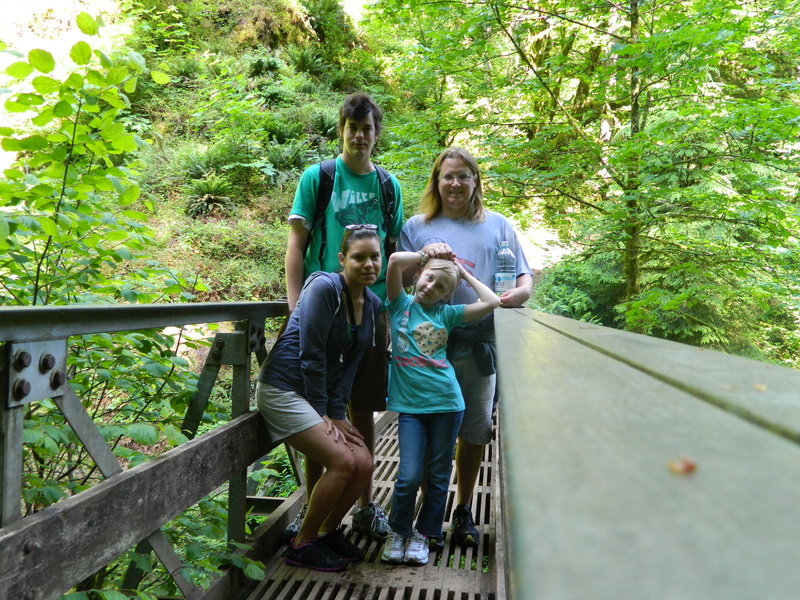 We were posing on a bridge above Oneonta Creek on the Horsetail Falls loop trail in the Columbia River Gorge. 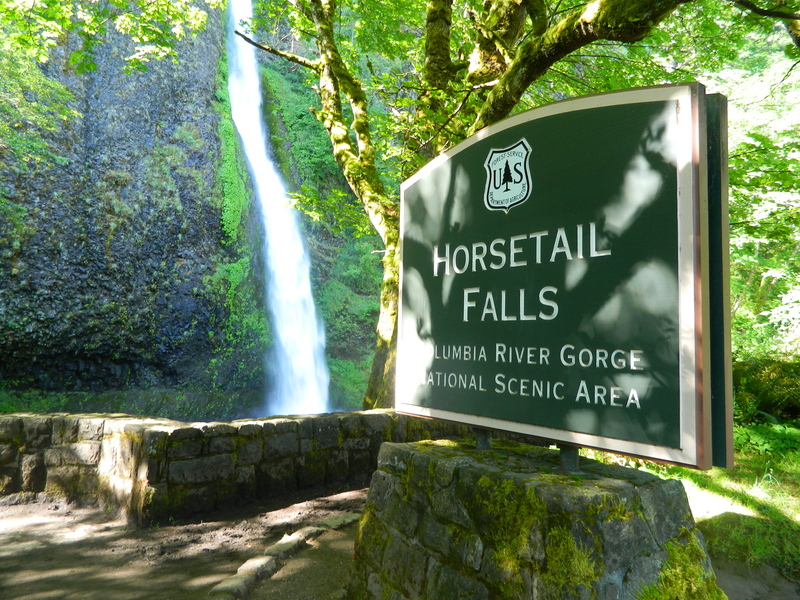 So if you find yourself in the Gorge and you want to get off the beaten path and not just see Multnomah Falls, then find Horsetail Falls and turn left. It’s worth it. Location: Off of I-84’s Exit 35 and onto the Old Columbia River Highway in north-central Oregon. When: All times of year, though flows will be higher in the spring. 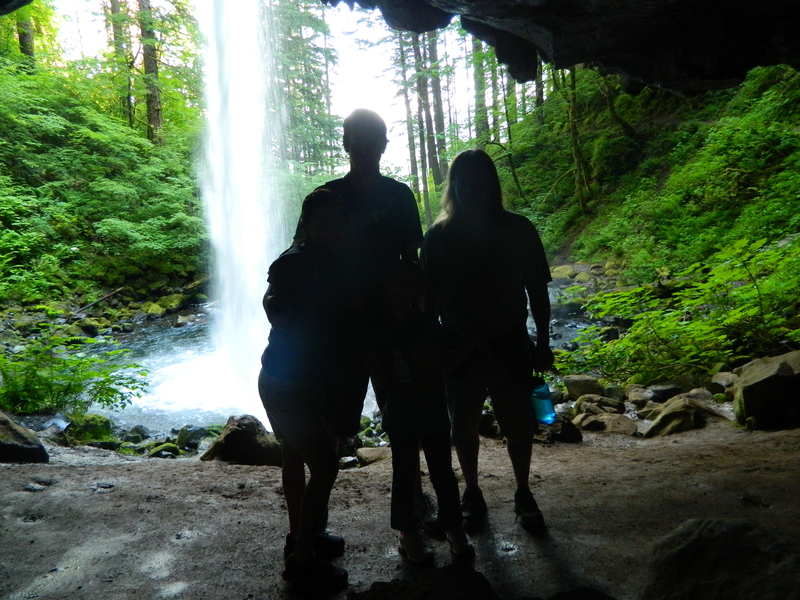 What: Ponytail Falls also called Upper Horsetail Falls. Beautiful waterfall with a carved out space behind it, allowing hikers to walk behind the falls. 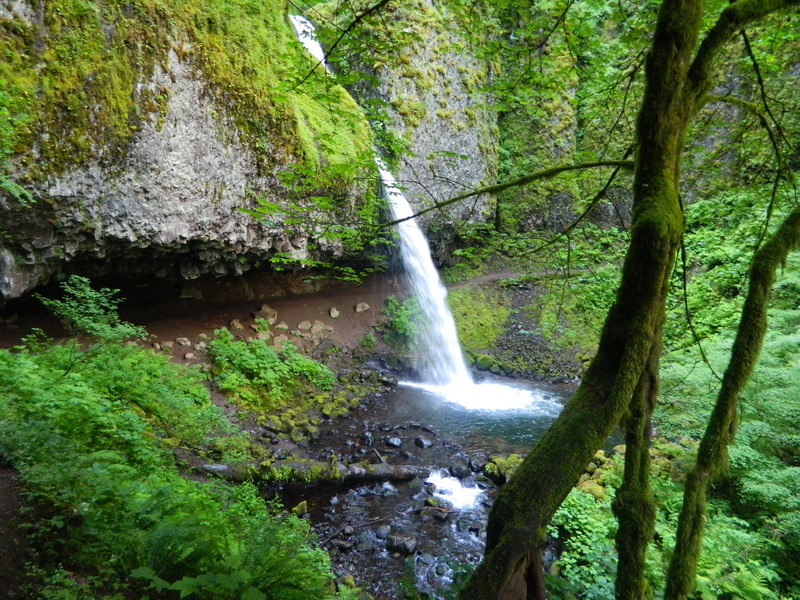 2.5-mile loop from the Horsetail Falls parking lot with 440-feet of elevation gain. Steep switchbacks greet you out of the parking lot, so be prepared. 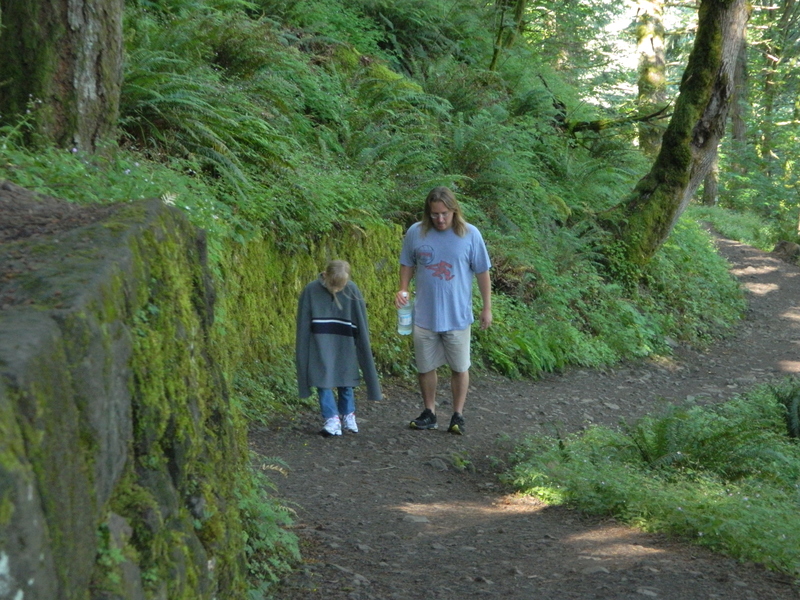 Kid-friendly: We had a 9-year-old with us who grumbled a bit, but conquered the hike with ease. Keep track of the little ones on top of the bluff as there are signs about deaths in the area from children falling off the steep edges.